DES MOINES, IOWA, Sept. 15, 2016 – The first-ever German Christmas-themed market, known as Christkindlmarket Des Moines, is set for Dec. 2 to 4 in downtown Des Moines at Cowles Commons just across from the Des Moines Civic Center. Produced by the Des Moines European Heritage Association (DMEHA), a local non-profit organization, the inaugural event will offer attendees an authentic outdoor Christmas market experience with food, music and unique gifts that has been a holiday tradition which began in German-speaking Europe nearly 700 years ago. Village-like huts decorated with holiday lights and garlands will house a variety of vendors from across the Midwest offering wares such as hand-dyed scarves, baked goods, teas, hand-knitted items, knives, and much more. 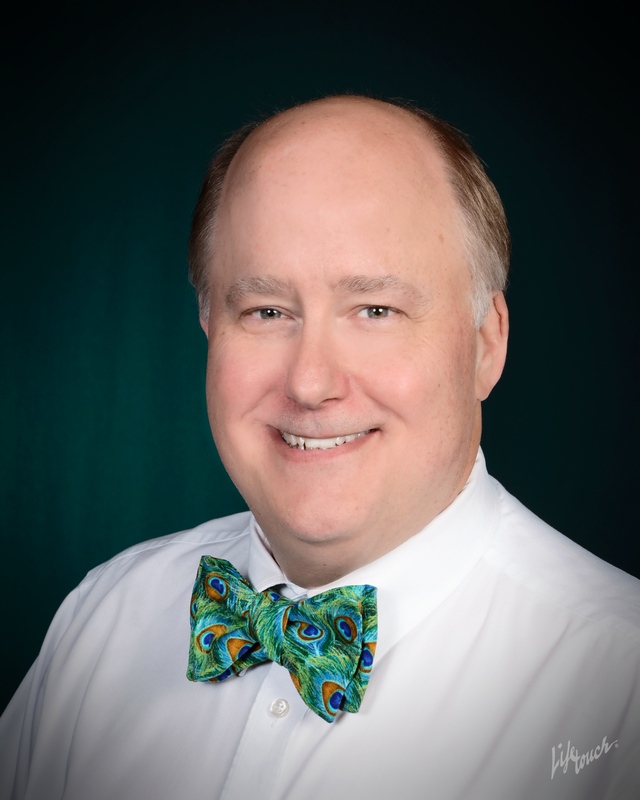 Aside from the holiday treats and gift items, marketgoers will enjoy a host of local and statewide music ensembles from high school choirs to professional entertainers – all with a holiday theme or twist. A highlight of the Christkindlmarket Des Moines, like all German Christmas markets, will be the hot, spiced mulled wine known as Glühwein (gloo-vine), literally “glowing wine” in German. Those who attend the event early enough can purchase a collectible Glühwein mug featuring original artwork by a German artist to commemorate the inaugural Des Moines event. To ensure the purchase of the limited edition mugs, Hull advises pre-ordering them at the DMEHA website or at www.christkindlmarketdsm.com with a gift of $25 or more. Christkindlmarket Des Moines sponsors include: Darcy Hines Designs, Drake University, The Museum of Danish America, Gail’s Photography and Designs, Action Electric, Greater Iowa Credit Union, Iowa Sister States, Ingersoll wine & Spirits. 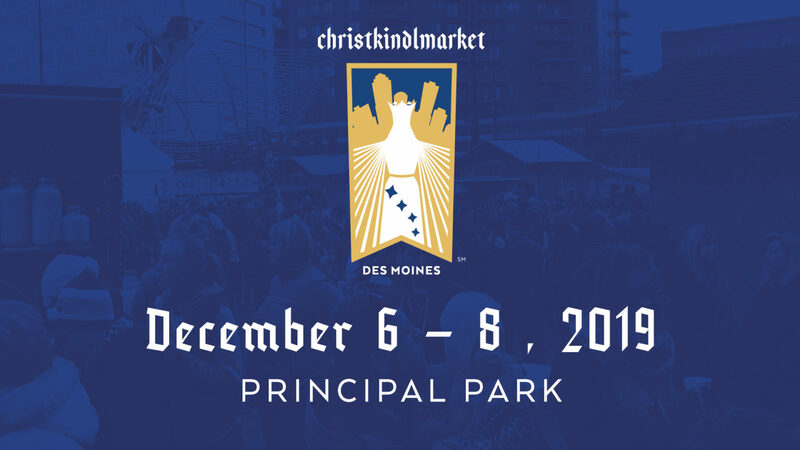 For a full list of sponsors, visit www.christkindlmarketdsm.com. Christkindlmarket Des Moines community supporters include: Patty & Jim Cownie Charitable Fund, The Deb and Paul Hayes Charitable Fund. We really enjoy getting out and talking about the mission of Des Moines European Heritage Association! We’ve had such a great summer visiting various farmers markets and festivals. We’d love to see you at the World Food & Music Festival this weekend! We’ll be on the west end of the Court Avenue Bridge. 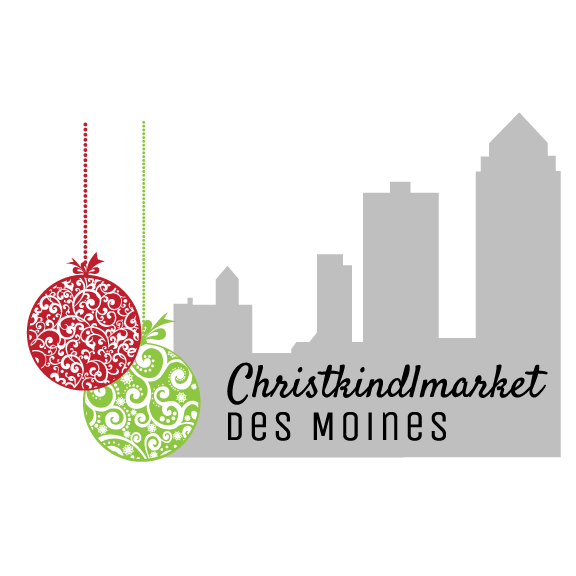 Stop by to make a Christmas ornament and learn more about Christkindlmarket Des Moines taking place December 2 – 4, 2016! The 2016 Festival will feature Cuisine from Around the World! Saturday Fireworks – 10 p.m.
Friday, Sept. 16: 11 a.m. – 10 p.m.
Saturday, Sept. 17: 11 a.m. – 10 p.m.
Sunday, Sept. 18: 11 a.m. – 5 p.m. I am a professional technical manager and an amateur husband and father. I lived in Germany as a student and professional and attended many Christmas markets. I would love my children and eventual grand children to experience the old world charm and flavors of their European Heritage. For Christkindlmarket Des Moines 2016, German designer Sabine Voigt, has crafted a Christmas-themed design for our Glühwein mug. Voigt studied in Dusseldorf, Germany and San Diego, CA, graduating as a graphic designer. Previously she has worked for companies such as Rolling Stone Magazine, Cologne Cathedral Christmas market, Kölner Bank, and many others, as well as designing a variety of mugs for Christmas markets around the world. Voigt has been awarded 1st place in the Charlie Hebdo Cart Competition, awards in the International Cartoon contest, the European Cartoon contest, and a variety of other awards and decorations. Her work has been presented in Portugal, Germany, America, Spain, and other countries world wide for its colorful and youthful appearance. DMEHA is excited to have the opportunity to further display her work by using the design featured below on our 2016 Glühwein mug. Guarantee your Glühwein mug this year by making a donation of $25 or more to Des Moines European Heritage Association. DMEHA will be ordering a fixed quantity of Glühwein mugs and would like to ensure supporters are guaranteed this keepsake collectors item – especially from the inaugural event. 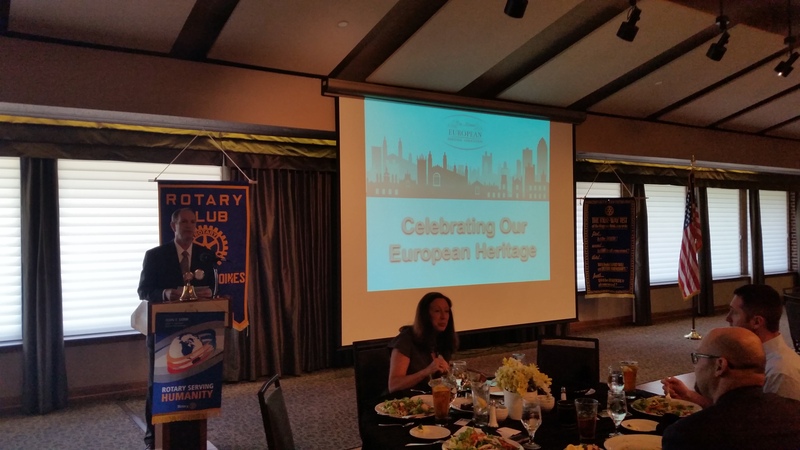 Suzanne Hull, the Des Moines European Heritage Association (DMEHA) Board President, had the pleasure of speaking to the Rotary Club of Des Moines AM. If your networking group, church group, neighborhood association, etc. would like a member of our organization to visit to talk about DMEHA and Christkindlmarket Des Moines, please let us know! Take afternoon tea like a Londoner here in Des Moines on Sunday, September 25 from 1-3 pm! The inaugural Afternoon Tea Along the River is a British tea event in an elegant setting with views of the Des Moines River from the Principal Riverwalk Hub Spot Park. Tickets are $35 each, including ticketing fees. When purchasing your ticket, add a glass of French sparkling wine for $11. Gather your friends and don your fancy hats for a memorable afternoon! At the event, loose-leaf British teas provided by Gong Fu Tea and finger sandwiches, scones with clotted cream and jam, and petite desserts by Trellis Catering will be served. 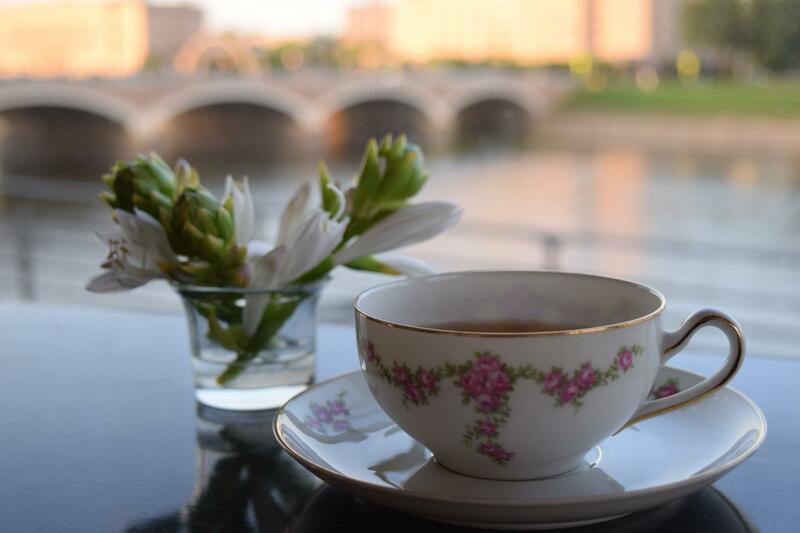 Vintage dishware supplied by Vintage Love, Rentals & annessi and lovely, live violin music will set the mood and send you on a trip to a traditional British High tea. There will also be a contest for the best hat or fascinator (decorative headpiece commonly worn by Brits), as well as a silent auction. When booking, please indicate the names of all guests in your party so that we can do our best to seat you together. Parties of two will be seated with other guests. Please indicate dietary restrictions when purchasing your ticket; we will do our best to accomondate your needs. 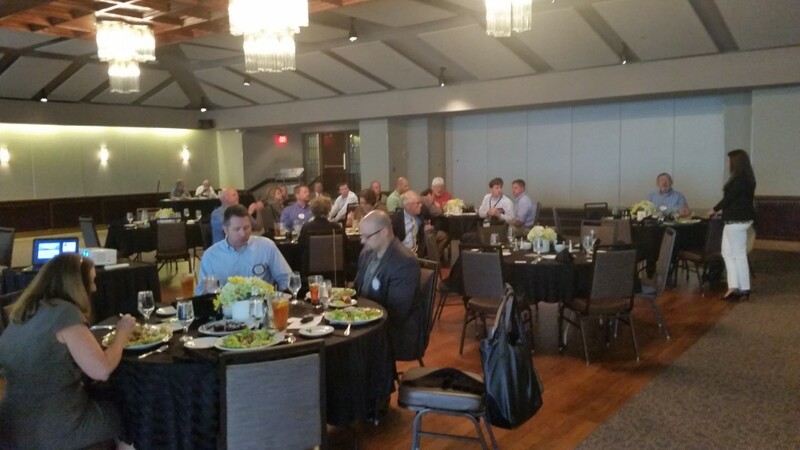 Suzanne Hull, Des Moines European Heritage Association (DMEHA) Board President, had the pleasure of speaking to the Rotary Club of West Des Moines. If your networking group, church group, neighborhood association, etc. would like a member of our organization to visit to talk about DMEHA and Christkindlmarket Des Moines, just let us know! DMEHA was awarded the Community Betterment Grant Award on August 2, 2016, by the Polk County Board of Supervisors and is happy to have their support. The Polk County Board of Supervisors offers this unique funding opportunity to community service organizations throughout Polk County. The Polk County Community Betterment Grant Program was designed to provide financial support to non-profit organizations that provide cultural, recreational, educational, and human needs services to citizens. Polk County has a rich history of partnering with public and private entities to provide effective programs and services to the community. 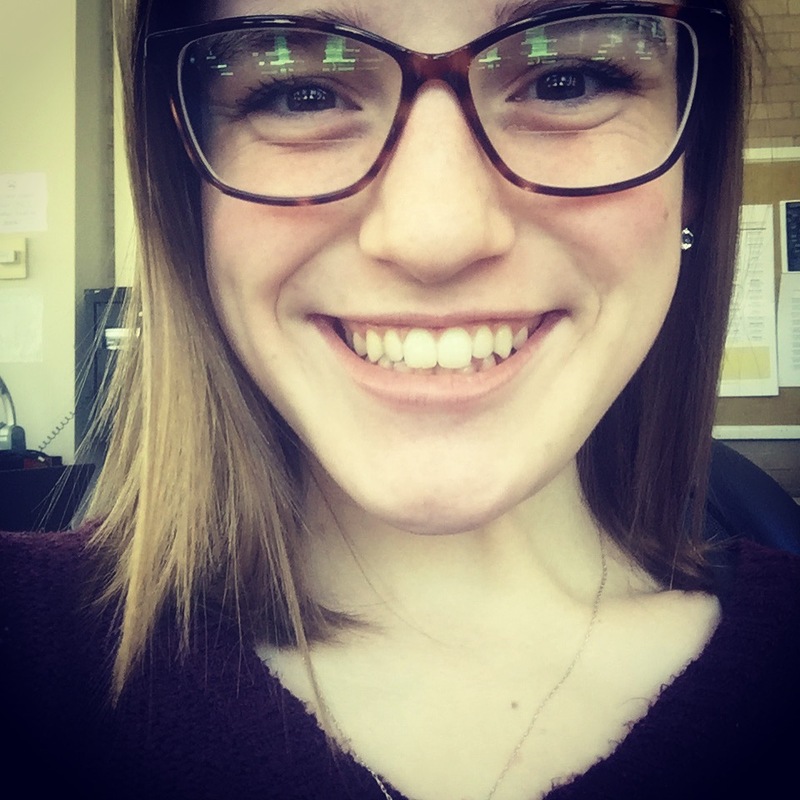 Meet Rebecca Banger, DMEHA Intern! Rebecca Banger is currently a second year student at Drake University, studying Advertising and Public Relations with emphasis in design. She will be a graduate of Drake’s class of 2018 and hopes to work in PR in Des Moines. Banger is from small-town, Farmington, Missouri, and is actively involved on campus and around Des Moines. 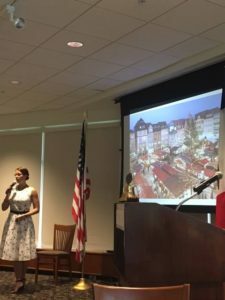 Banger decided to get involved with the Des Moines European Heritage Association and Christkindlmarket Des Moines planning as she is very interested in the culture of Des Moines and the European influence on the city of Des Moines. It is Banger’s dream to experience as much culture as she can and everything else the world has to offer. Banger plans on accomplishing this goal by learning about European culture and hopefully traveling in the future. Join us at the 11th annual Young Professionals Connection Volunteer fair Thursday, August 18 from 4-8. The YPC Volunteer Fair connects greater Des Moines residents of all ages and interests with over 70 non-profit organizations that are searching for volunteers and support. Attendees will have the opportunity to speak with a diverse selection of organizations on ways to get involved. DMEHA is looking for volunteers to come and tend the booth and show the residents of Des Moines exactly what DMEHA is all about!